Recommended Name: � the Later Minchiate pattern. This pattern was originally classified as IPT-1.1. In the second quarter of the 18th century, an as yet unidentified Florentine maker introduced this pattern as a new classicised version of the Minchiate pack, in keeping with contemporary taste. Save that the short tunics of the Kings of Swords and Batons were replaced by long robes, the iconography of the traditional pattern, IPT-1, was retained, as were many of the details of the numeral cards in the suits; but the detailed designs of the trumps and court cards were for the most part completely altered. Three 18th-century packs of this type, of varying degrees of incompleteness, are in the Lady Charlotte Schreiber Collection in the British Museum. It does not appear that the new pattern made much headway in competition with its older rival, but in about 1850 it was revived, or possibly simply continued, in a revised form by Chiari of Florence. The 19th-century version is somewhat less elaborate than the 18th-century one: It follows it closely or exactly on most of the cards, but diverges from it on about a quarter of the trumps and court cards. This version was also produced by Baragioli of Florence in c.1880. It did not supersede the earlier pattern which continued to be made in Florence until the 1890s, and probably remained more popular there than IPT-1.1 as long as the game of Minchiate continued to be played; but it was adopted by Solesio of Genoa (late 19th to early 20th century), who continued to produce it until the 1930s, and it was therefore the pattern used for the last Minchiate cards to be produced, surviving its rival by about three decades. The composition is exactly the same as that of the traditional Minchiate packs. There are 97 cards, comprising 56 suit cards, 40 trumps and the Matto. The top five trumps are unnumbered, and the remainder numbered from I to XXXV. The Swords are straight but intersecting. 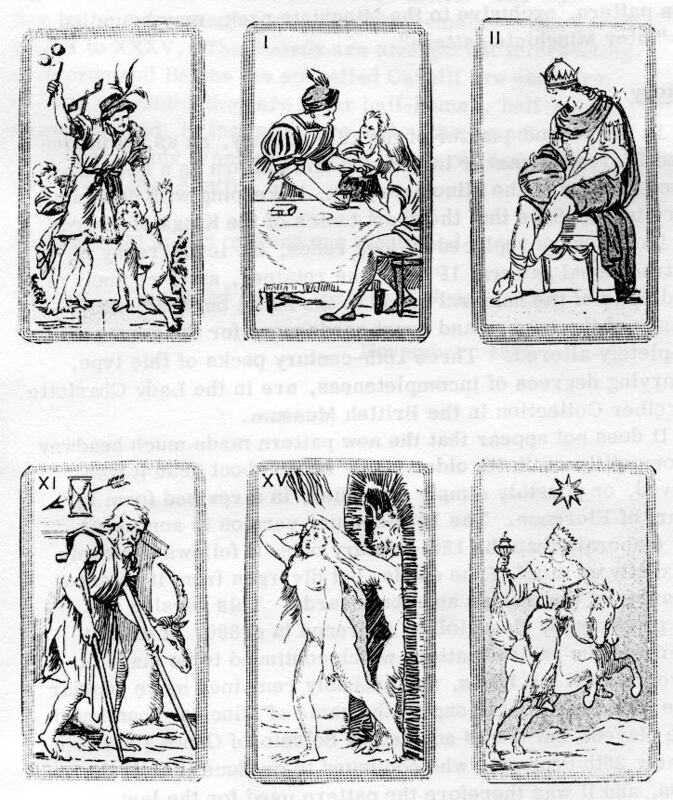 In Swords and Batons the so-called Cavalli are centaurs, in Cups and Coins they are other half-human, half-animal monsters, and, in the latter two suits, the lowest court cards are Maids (Fantine), though in Swords and Batons they are Jacks (Fanti). All presently known makers are mentioned under History. 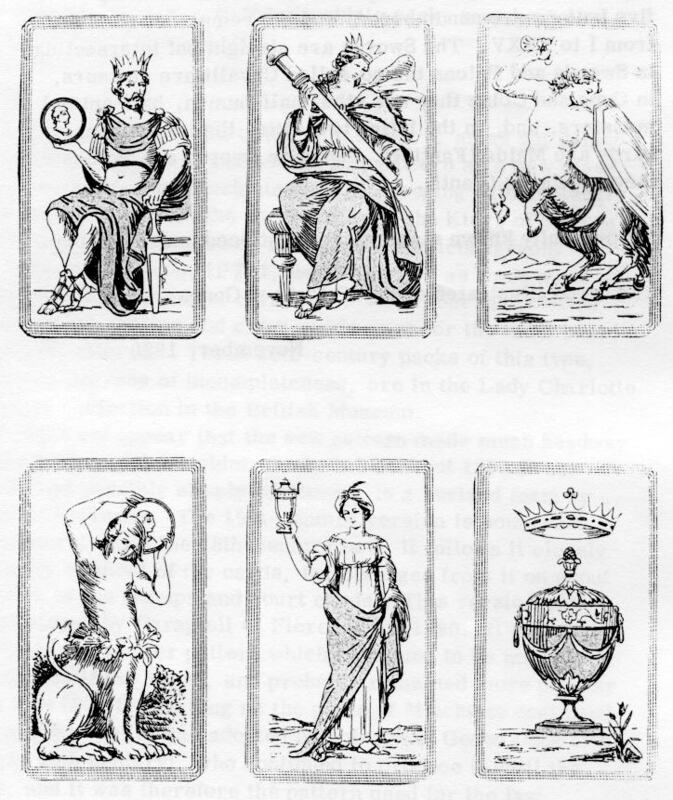 Cards made by Solesio of Genoa.